Top of the table Leyton Orient are Pools’ next challenge in the National League this Saturday but what should we expect from them? Hartlepool are going into this game with a 2-1 win over Braintree Town two weeks ago. 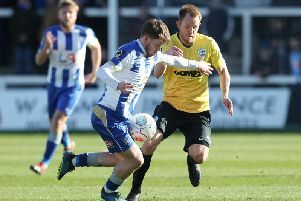 Without a game last weekend due to a frozen pitch at Ebbsfleet, Pools will hopefully have no rustiness to shake off - especially against one of the best teams the National League has to offer. What system will Leyton Orient play? Orient play in the classic 4-4-2 formation with two wingers and two strikers providing the attacking threat. The back four at Orient’s disposal is a mix of youth and experience and this has been working very well for the club. Jamie Turley (28) partnered Dan Happe (20) in the club's last game at home to Maidstone, the game finished 3-0 to the hosts. Who are Leyton Orient’s key players? Striker Macauley Bonne is averaging a goal every 135 league minutes for Orient. With 20 already for the season, his partnership with youngster Josh Koroma has led to transfer links to clubs in higher divisions. It was reported Sunderland made a bid for 20-year-old Koroma on deadline day. Other than the strikers, The O’s have a very experienced team with the likes of Charlie Lee and Jobi McAnuff helping with the promotion charge back to the football league. Getting the occasional goal from other people than Koroma or Bonne (29 between them) has aided the league leaders a lot this campaign. Do Leyton Orient have an injury worries? One key player will be missing for Orient this weekend in Koroma, the youngster has picked up a hamstring injury and will be out for up to six weeks. A big blow for the away side. James Alabi seems to be the next striker down the pecking order for the visitors this weekend. The Stoke City youth player has appeared 23 times this season scoring twice. Who is Leyton Orient’s manager and what can we expect from him? Former Gillingham manager, Justin Edinburgh, is at the helm at The O’s and has been since November 2017. He has an impressive 1.8 points per game after 55 matches so far at Orient and has turned them into a real force at this level. Under his management for most of last season the London based club finished 13th after a poor start to life in the National League - just like Pools. What form have Leyton Orient been in? Orient’s form has dipped recently despite being three points clear at the top of the league. With one win in their last six outings Pools will try to take advantage of this drop in form. The most damaging defeat for Edinburgh’s side recently was the 3-0 home defeat against promotion rivals Salford City.